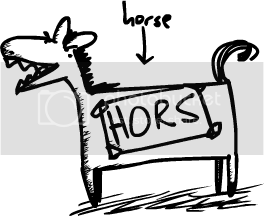 This morning I set myself the task of drawing a horse VERY BADLY. Anyone want to show me their worst drawing of a horse? (Feel free to post it in the comments!) They are rather fun and therapeutic to draw badly. The worse, the better. If you're looking for something to do in London or Cambridge this weekend, throw on your most elaborate cosplay outfit (I'm linking 'cosplay' cause I bet my mum doesn't know what it means) and come along Saturday to London's MCM Expo, where I'll be sharing a table with Gary, and we're right next to the DFC's (and Beano's) Laura Howell and not far from David O'Connell ( tozocomic). You can buy a copy of Morris the Mankiest Monster for a tenner, and I'll throw in a drawing and some sooper-dooper Morris badges. And on Sunday I'm giving a talk and selling books in Cambridge at the Women in Comics conference, maybe see you there! didn't even plug my wacom in, i am so dedicated to this cause i am willing to use my trackpad thing to draw with! I went to three of four of the MCM expos (once cosplaying as Testso). But I'm not interested in actors, and none of programme items caught interest except the cosplay parade, and tickets for for that always sold out before I got to the stand. If I wanted tickets I'd have had to get there so early, and hang around there for about 5 or 6 hours. Both of these year's expos have looked fantastic for comics stuff, just not quite £10 entrance fantastic. I'll get my cosplay kicks at the grand cosplay ball, and my comics kicks from the UK comic specific cons. Ha ha! That is truly fantastic! Hee hee, I think that one wants to be a unicorn. Those are all great horses. 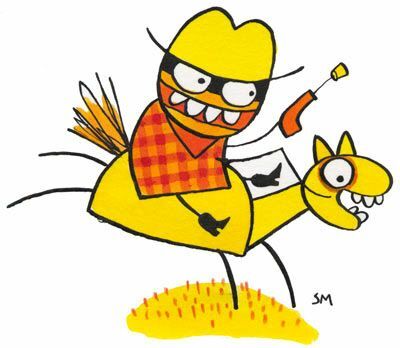 I drew a horse once when I was thirteen, for a school newspaper, and other kids laughed at it. They laughed! ...actually turned out better than I expected! AAA!! What happened to my beautiful horses!? Livejournal has crushed them! Well, If you put in all the spaces that have been deleted for some reason you can see two rather questionable looking horses. Ha ha! I was going to say that is totally in the spirit of the game, the worst horse I have ever seen! ;-D Yay! Ha, I suppose I win the game for just passing off a jumbled collection of characters as two horses. Though it wasn't my intention. Honest, guv!